Cant grow your nails past a certain length? Want beautifully glossy nails without having gels? then this post is for you. I was one of those unfortunate people to have nails that where so weak that they would constantly peel and break at a certain length, it is really frustrating when all you want is those beautiful,long and strong nails but you just cant get there. I think they started to get worse after i moved house as i could no longer have a dishwasher due to not having enough kitchen space, so as you've probably guessed everything is hand washed, and much to my joy its only me that does it! doing this all the time had made my hands horribly dry and my nails left suffering too (blimey that sounds so dramatic..but its true). 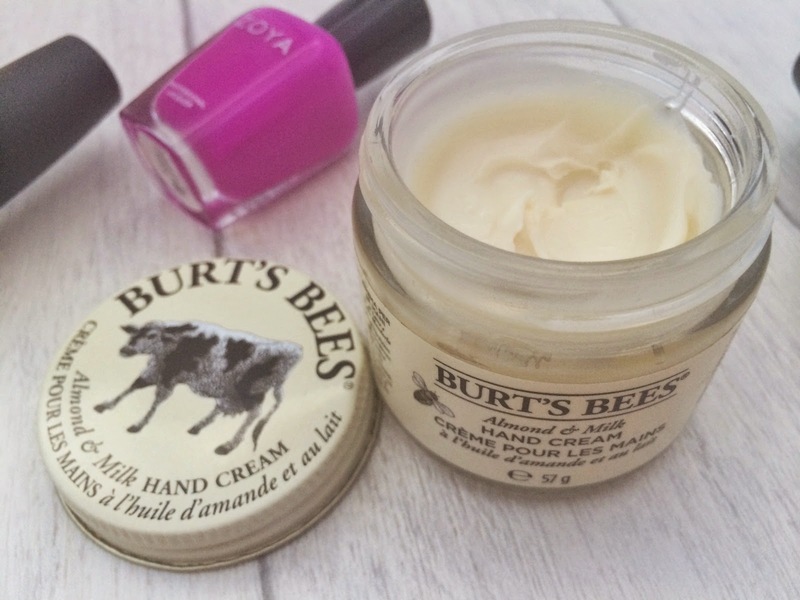 I then got myself into a nail care routine, and these products have worked wonders they a complete must have..not just for people with bad nails like me..for everyone!! I had thought about buying this for ages, and to be honest the hefty price tag put me off a bit a lot! Then i spotted that my amazing friend Abbie reviewed this product on her blog A Beautiful Delight, and obviously did an amazing job as i went out the next day and bought it. There are so many positive reviews around this product, and O.P.I being my favourite brand for nails i knew i would end up getting it at some point...plus i was really desperate and willing to pay the odds, i had tried cheaper alternatives that are about and nothing really impressed me much - Shaina Twain anyone ! This didn't work wonders for me straight away ill admit, it took a few weeks or so to notice any difference, the peeling wasn't as bad, they stopped breaking as much and now they are the longest they have EVER been and amazingly strong too, i was so sceptical about this but hand-on-heart it really works and has saved my nails completely..so thank you O.P.I and Abbie. This is one of those products i constantly re-purchase, i just cant be without it! 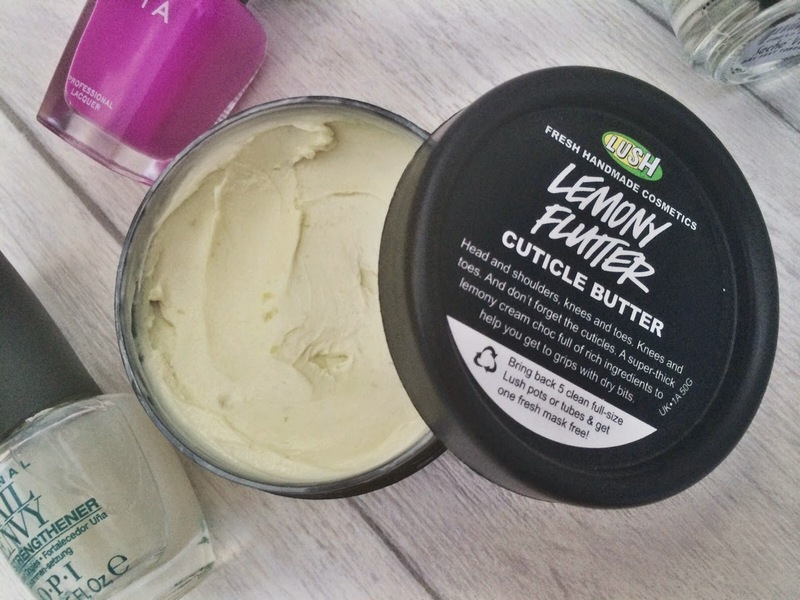 its a really thick consistency hence the name "cuticle butter". It does an amazing job at moisturising the cuticles, i find this also aids in making my nails grow back healthier. Keeping your cuticles in check is most important to achieve those nails you've always wanted, if you have not given this lush product a go i suggest you try it, you get loads of product and a little goes such a long way.. you really get your moneys worth, plus it smells like lemon cheesecake.! Oh! and not to mention its multi-purpose uses, i use it on my elbows, feet and other dry parts too its superb, it soothes and smooths any dry and irritated skin with its wonderful cruelty free - Au natural ingredients. I must have gone through bottles and bottles of this stuff, its truly amazing..I'm always bashing on about how much i love it over twitter and instagram, when i post pictures of my nails and people ask how i get them so shiny, this is it!! It makes any nail polish look immaculate like you've just had gels, i honestly don't know what i would do without it. Seche Vite Dry Fast Top Coat certainly does dry your paint job super fast which is so handy for me having 2 little boys to chase around, ain't no body got time for that! After i have applied this my nails are left smooth, glossy and perfect looking and i don't even have to wait hours for it to dry and who wouldn't want that?! it also makes my polish last so much longer.. i urge you to try this, you wont regret it. This hand cream has to be the thickest I've tried but also the most moisturising one (and i own a lot of hand creams), its perfect if you suffer with dry hands like me, i always use this after I've done the washing up and it stops them from getting sore and dry in an instant, its also great as a hand mask if you pop gloves on after for a few hours, i do this sometimes before bed if they need some extra TLC and the next day my hands are baby soft. It has quite a strong almond scent so some may not like it, as it could be slightly over-bearing but i personally love it. Then for me the most obvious thing to go along-side a manicure is your nail polish, my favourite brand as i mentioned above has to be O.P.I. i just find they last the longest on my nails and i find the brush so easy to use and precise, but today i opted for something different and gave Zoya - Charisma a go and I'm just loving this vibrant purple shade, what do you think? What are your Manicure Must Haves ? Have you tried any of the mentioned products? what do you think? i would love to hear your thoughts. I'm dying to try Zoya polishes! I'm rather tempted by the cuticle butter too haha. I don't think I could live without seche vote- I can usually find it on ebay for less than £6 too :) I'm always asked if I have gel nails when I use it too, a definite must have! Love that Zoya colour - your nails look literally perfect! I love doing my nails but no matter how much I do it, I never seem to improve aha!